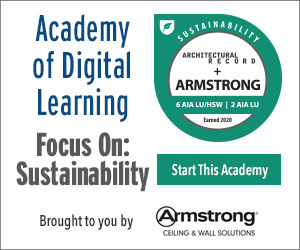 Discuss the key sustainability criteria (LEED and SITES) that apply to the design of exterior spaces and outdoor rooms. Describe some of the various product systems that are available for designing exterior spaces and outdoor rooms, and understand each system’s compliance with sustainability criteria. List design options for exterior deck spaces regarding railings and safety. Explain the ways in which exterior spaces and outdoor rooms can help to meet LEED and SITES requirements of human health and well-being. There’s a lot to love about the outdoors, and this course will explore ways that architects and designers can make inviting and comfortable outdoor spaces that link the outdoors to the interior. There are a variety of products and materials that provide options for designing patios, decks, and outdoor rooms, and that provide experiences in outdoor dining, animated outdoor activities such as poolside recreation, or just relaxing and taking in the surrounding landscape. In addition, outdoor living spaces and rooms can greatly increase the appeal of a home, restaurant, or hotel, and thus increase its value and marketability. Interior spaces can be linked to outdoor settings through glass windows and doors, roof decks, clearview railings, and the use of natural materials. One of the ways to link the exterior and interior of a project is through glass. Extending an indoor room to the outside by opening views through glass windows or doors helps to enhance the interior. Expansive windows and doors allow natural light to penetrate into interior rooms as well as provide a visual extension to an exterior space. Natural light penetrating into interior spaces can also reveal textures and patterns through shadows and provides cues as to time of day. There are a wide range of material framing systems for windows and door product. Two common systems are all aluminum and combinations of aluminum with wood cladding. The aluminum- and wood-clad frame system provides the reduced maintenance of an aluminum clad finish, plus the aesthetic appeal and warmth of wood. The aluminum is bent and folded over the exterior of the door or window frame to prevent weather from penetrating into the wood frame. This example at Saffron Fields Vineyard shows a window system that allows both light and the outdoors into an interior space as well as provides architectural aesthetic. The owners of Saffron Fields Vineyard were inspired by architecture using glass, wood, and water for the ability of these materials to evoke emotion through fluidity and serenity. The 89-acre site was originally a dairy farm that had a large pole-barn structure. The barn was deconstructed to provide both structural and finish materials for the tasting room and gallery. 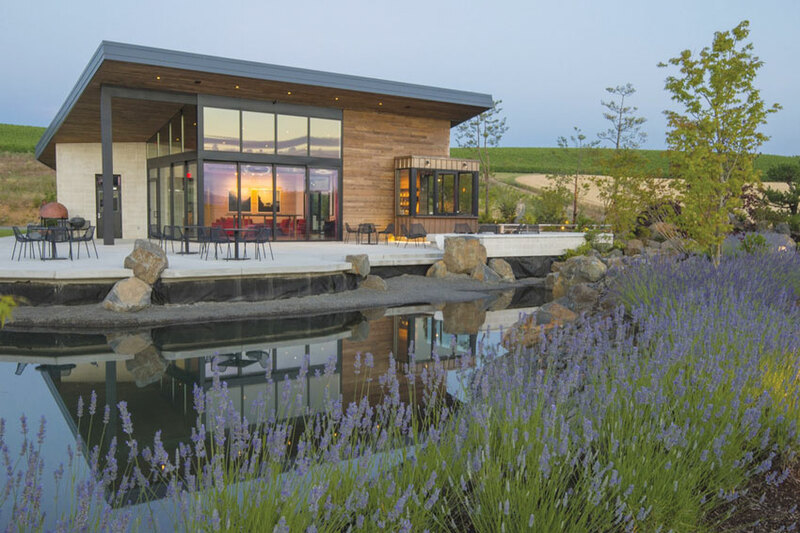 The owners commissioned Architect Richard Shugar to design their Saffron Fields Vineyard Hospitality Center and requested that it integrate with the surrounding landscape to inspire an atmosphere of contemplation and ease. The design focuses on the building being rooted in the landscape so that the structure emerges from the landscape itself. 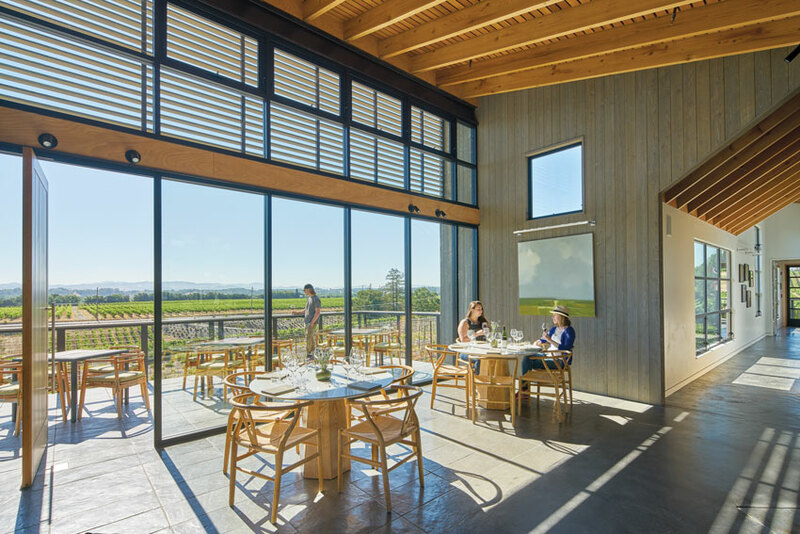 Richard Shugar utilized expansive bifolding windows and doors when he designed the tasting room to retract by 12- and 8-foot sections that completely open on warmer days, exposing the vineyard and gardens beyond. In addition to the sustainability of using recycled wood in much of the building, the thermal mass in the concrete floors allows for sun to be absorbed and carry passive heat throughout the building via the expansive glass windows and doors. The windows are also energy efficient. Windows and window systems are available in various styles and sizes and can be customized to fit the project design. Designers have the option of selecting fixed, casement (inswing or outswing), hopper, awning, sliding, and tilt and turn (inswing only) window products depending on the project requirements. One of the key considerations when selecting a style or type of window is energy efficiency. The National Fenestration Rating Council (NFRC) operates a voluntary program that tests, certifies, and labels windows, doors, and skylights based on their energy performance rating. NFRC labels can be found on all ENERGY STAR-qualified windows, doors, and skylight products. Two major categories that are reviewed by the NFRC with respect to energy performance ratings are Sunlight Transmittance and Heat Gain and Loss. Windows can gain and lose heat via 1) the direct conduction of heat through the glass or glazing, the frame, and/or door; 2) radiation of heat into or out of the room or building; and 3) air leakage through and around the window and door panels. The U-factor, solar heat gain coefficient (SHGC) and air leakage are evaluated by the NFRC to measure and rate the energy performance of windows, glass doors, and skylights. The U-factor is the rate at which a product conducts non-solar heat flow. The lower the U-factor, the more energy efficient the product. Rainier cable rail systems are the ideal solution when looking for an exceptionally sleek, modern, and virtually transparent railing system. Rainier features an elegant, linear aesthetic with its custom-made, low-profile stainless steel support structure and thin, highly durable stainless steel cable infill—a perfect fit for stairways, decks, and outdoor living areas. Manufactured in the USA with 20 percent post-industrial recycled materials, Bison Pedestals create level decks over sloped surfaces. Bison Pedestals elevate and support wood tiles, pavers, site furnishings, and a variety of other surfaces. Bison Wood Tiles are commercial grade, constructed from sustainably harvested hardwoods, and available in standard and FSC-certified species. Our line of glass folding doors and other types of folding doors are an excellent way to maximize an opening without having to necessarily pocket the doors. Folding doors are an ideal choice, as they swing and stack to either the interior or exterior. Real Cedar is nature’s most versatile building material. Rich in tone and texture, this beautiful, durable wood is ideal for contemporary design, especially outdoor applications. It’s naturally resistant to rot, decay, and insects. It’s also pitch and resin free, which means it accepts and holds a wide range of finishes beautifully.